In the spring of 1879, the catalogue of the fourth Impressionist exhibit listed Portraits at the Stock Exchange among the twenty-five works grouped under the name Edgar Degas (fig. 1). When, if ever, the painting actually appeared in public that year remains, however, an open question. Gustave Caillebotte, for instance, reported that only eight of Degas’s works had been hung on April 10 when the galleries opened on the avenue de l’Opéra.1 Over the next month of the show almost none of the numerous critics reviewing the exhibition came to acknowledge the existence of the picture. The one exception was Louis Leroy who, in typical comic mode, noted in passing a “man’s hat, under which, after the most conscientious researches, I found it impossible to find a head.”2 Although Degas’s picture was also listed again in the catalogue for the next Impressionist exhibition, Leroy’s cryptic aside constitutes the entirety of its critical reception in the circumstances of its historical beholding. Consequently, the standard reading of the painting’s tone and meaning have only emerged piecemeal over the last century or so. In her 1991 book, Odd Man Out: Readings in the Work and Reputation of Edgar Degas, Carol Armstrong gives one of the most nuanced and attentive descriptions of the work. “This place of business is not cool and clean and open,” she writes, “rather, it is a murky, secret netherworld, as behind-the-wings and other-side-of-the-keyhole as Degas’s foyers, loges, and boudoirs, peopled with marginalized physiognomies as suspect as those of his dancers, demimondaines, and criminals: witness the two figures behind the pillar to the left, very similar to Degas’s Criminal Physiognomies.”3 These lurking, sinister figures do not quite present the readability of character implied by nineteenth-century physiognomy, but in their sketchy rendering and shadowed features they convey an indecipherability of action and intent that serves as a dark mirror-image of the same.4 Armstrong continues: “Illicit and unclean—the Stock Exchange is a blacker, dirtier picture than any of Degas’s others—this is business conducted in secret. 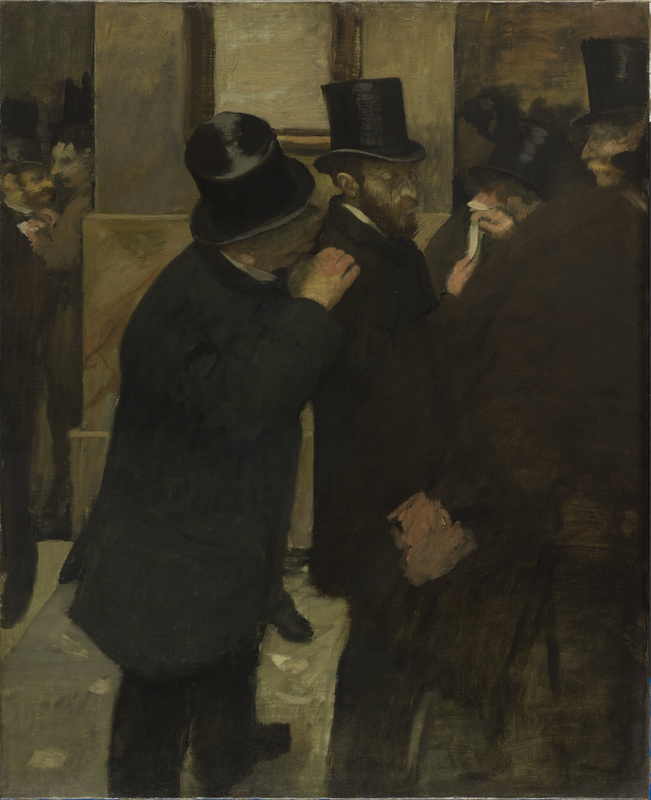 It is a picture of clandestine commerce, depicting the exchange of market information as a species of covert operations conducted through furtive whispers and spying glances.”5 Such a reading constitutes the dominant art historical account of the work’s signification—in Degas’s hands a portrait of public stock trading has become a representation of shady, back-room dealing. The modern reading of Degas’s Portraits at the Stock Exchange runs aground, however, at precisely this point. As will soon become clear, the evidence overwhelmingly confirms that the setting of the painting is, in fact, the interior trading hall of the Bourse. As a consequence, and despite the existing art historical consensus, the financial dealing of the depicted figures could be, and perhaps should be, construed as above-board, legitimate, and conventional. As virtually no historical reception of the work exists, it is consequently difficult to say whether or not our assumptions about the murkiness of the painting constitute a projection of our own economic and political situation. To what extent, for instance, was Armstrong writing in the wake of the Crash of 1987? For our part, can we now escape seeing the painting in the shadow of 2008? Would it not have been possible, by contrast, to see the painting as a non-critical representation of the stock exchange, of finance, of business in 1879? In what follows here I want to try—and rather modestly, I should admit—to move beyond a mere description of the appearance and tone of Portraits at the Stock Exchange, to the more historically situated question of meaning. What, I want to ask, did Degas intend by choosing to depict these men, at this location, murkily performing a “clandestine commerce”? Or more precisely what kind of financial transaction are they performing, and with what significance for a beholder of the work at the time? Ultimately, the argument will turn on whether the painting’s representation of their business dealing can be understood without a more precise accounting of its location. It will also hinge on the historical retrieval of the nature and significance of finance capitalism at the moment of the painting’s production in 1879. One of the things that complicates any understanding of this work as a “picture of clandestine commerce” is its possible origins as a portrait commission. Importantly, the catalogue for the 1879 exhibit already lists Monsieur “E.M.” as the owner of Portraits, à la Bourse. Ernest May had been introduced to Degas through Caillebotte, and the three appear to have had dinner about a month before the opening of the show.8 He had only recently become interested in collecting Impressionist paintings, and the commission for, or purchase of, the stock exchange picture is in part a result of this growing collection. Although relatively young—he was 33 at the time the work was completed—May was a well-known agent of the Banque Franco-Égyptienne, itself a quickly diversifying international financial concern founded by Louis-Raphaël Bischoffsheim in 1870.9 In the 1880s, May became the director general of the bank. An early backer of the Panama canal project introduced by Ferdinand de Lesseps in May of 1879, he was later forced to testify following the collapse of the project and the revelations of corruption that ensued.10 His ultimate claim to fame, however, involved the more legitimate and successful negotiations for the backing of the construction of the Eiffel Tower in 1888.11 In later years, he ran the Comptoir National d’Escompte de Paris, the bank that eventually became BNP Parisbas, now the third largest bank in the world. In Portraits at the Stock Exchange, Degas almost certainly intended to portray May in a typical work environment, the Paris Bourse. The artist first established this location in a smaller preparatory study, also owned by May, in which the action of the scene is markedly less ambiguous (fig. 2). The pastel sketch fails to imply, for example, that any kind of “tip” is being whispered between the two central men—instead the attention is focused toward their apprehension of a document held aloft by the tall man at right. The central, bearded figure wearing a pince-nez is fairly obviously May, however much his appearance might suggest a somewhat older man. Yet, the relative significance of this identification has been questioned, not least it seems by May himself. 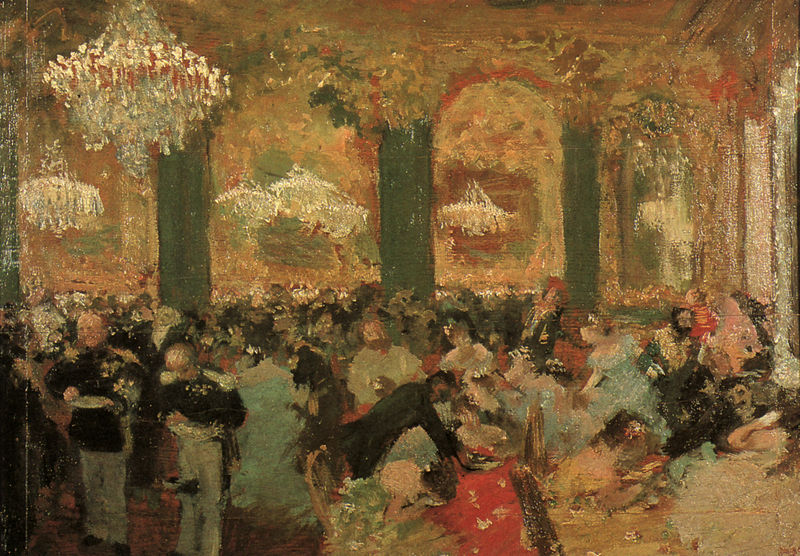 At the time of a major Degas exhibition in 1931, the banker’s son insisted that the pastel be titled simply A la Bourse (At the Stock Exchange), because his father apparently never considered it a portrait.12 By extension, Degas’s choice of a title for the oil painting—Portraits, à la Bourse, or Portraits, At the Bourse, as it appears in the 1879 catalogue—should be understood as deliberate. The sitter and the setting have quite obviously been blurred, and the precise identification of the sitter or sitters (as the title implies) became manifestly less clear in the larger and more publicly-oriented oil painting. The ready availability of the sketch has, nonetheless, encouraged art historians to establish and clarify a basic account of its iconography. In Jean Sutherland Boggs’s 1988 catalogue of the major Degas exhibition, Michael Pantazzi gives the surest description of the scene: “Under the portico of the stock exchange, a deferential secretary or usher presents May with a document, likely a financial statement. Behind May, his companion—identified . . . as a M. Bolâtre, an associate of May’s—leans forward to have a better look at the document.”13 Despite the authoritativeness of this description, it has not in fact been consistently clear which figure is May and which is Bolâtre. Somewhat earlier, Boggs herself claimed that it was May placing his hand on Bolâtre’s shoulder, not the other way around.14 Other aspects have likewise been defined without explanation. Henri Loyrette asserts that the paper presented by the red-haired man at right is a bordereau, or a document of account, but the final version does everything in its power to obscure this detail.15 The description elaborated by Pantazzi is, it should be noted, very specifically of the pastel, and only by inference of the painting. Nonetheless, it establishes with some limited historical precision the location and the action of the figures in both pictures. 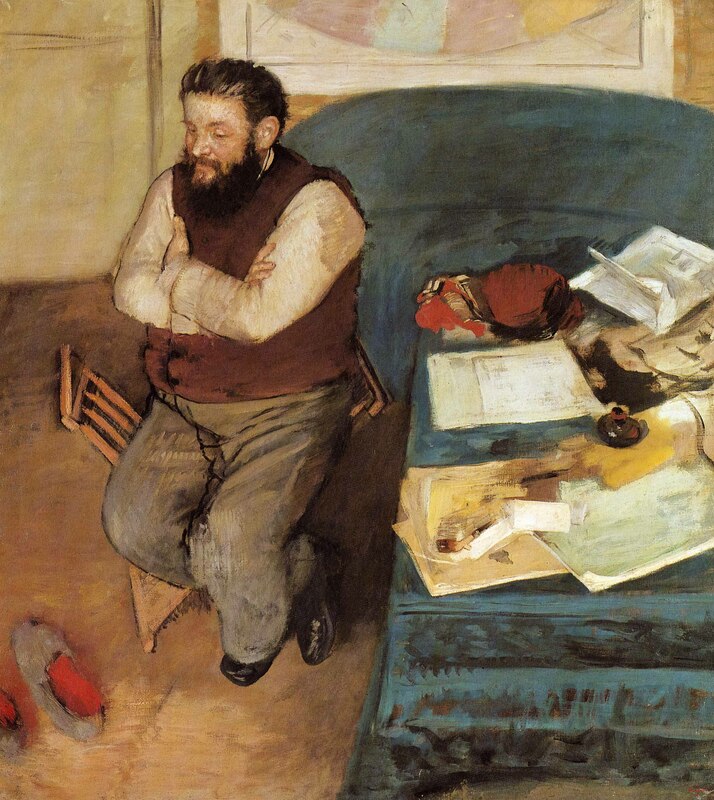 The relation of sitter and setting is significant for any historical account of Degas’s work. Portraits at the Stock Exchange should be situated among a series of portraits executed in about 1879, each of which places a man within a specific surrounding that exemplifies or elaborates his character or profession. Portraits of Diego Martelli and Edmond Duranty, for example, appear next to the portrait of May in the catalogue of 1879 (figs. 3 and 4). Each is about the same height, and at the time each was titled a “portrait.” The pastel and distemper depiction of Duranty alerts us to the intended complexity of this term. With his bookcases towering over him and his cluttered desk sweeping out in front of him, the art critic is dwarfed by the tools of his trade: they dominate the composition, enclosing and framing the ostensible subject of the picture. The writer connects metonymically to everything that surrounds him—a “Duranty” essay surely lies on the desk—not only elaborating his craft, but working through an implicit theory of the Realism he had so long defended.16 To reapply a phrase Duranty had written about Adolph Menzel only a few months before, Degas “was familiar with and rendered the characteristic aspect of a milieu.”17 In his 1878 review of the Exposition Universelle, the critic had originally used these words to compare Menzel with Honoré Daumier, but the fact that Degas proceeded to sketch an oil copy of Menzel’s Supper at the Ball when it was shown at Goupil in March 1879 indicates the profound harmony between artist and critic (figs. 5 & 6). By the time the pastel portrait of Duranty appeared again in 1880, its sitter had unexpectedly passed away. Along with Degas and a dozen other mourners, Joris-Karl Huysmans attended his funeral on April 13 of that year.18 He was thus especially attentive to the portrait when he reviewed it at the fifth Impressionist exhibition some days later—the critic no doubt sought to articulate how the work fit with the now-deceased critic’s conception art. Unlike most portrait painters, Huysmans pointed out, Degas sought to show the man’s authentic setting. “One needs to paint the character of the portrait sitter at home, in the street, in a real frame,” he declared, “M. Duranty is there in the middle of [au milieu de] his prints and his books seated behind his table.”19 In this careful choice of words, Huysmans quite deliberately evoked Duranty’s use of the concept of “milieu”—Menzel’s evocation of “the characteristic aspect of a milieu” becomes the “milieu” of Duranty’s prints, books, and table. Although possibly obscure today, both critics knew quite well the origins and ramifications of the use of this word. In the mid-nineteenth century, Hippolyte Taine had famously attached an entire theory of cultural production to the concept of milieu. In an authoritative account of his work, Mary Morton explains that milieu can be defined as the “climatic, geographical, political, social, and psychological conditions” that serve to determine the construction of any given individual or work of art.20 Along with what Taine called “race” and “moment,” milieu purportedly underlay all artistic production throughout human history. In a subsequent article Huysmans explicitly evoked Taine’s ideas, demonstrating the critic’s command of the conceptual underpinnings of his more subtle language in 1880. By this later date, however, he had come to admire art—Gustave Moreau is his example—that worked “against the grain” [à rebours] of its milieu.21 Within the naturalist literary circles of the late 1870s, however, the concept was widely appreciated. For art critical purposes, it is perhaps best paraphrased in Duranty’s own 1876 essay on what he termed “The New Painting”: “as we are solidly embracing nature, we will no longer separate the figure from the background of an apartment or the street. In actuality, a person never appears against neutral or vague backgrounds. Instead, surrounding him and behind him are the furniture, fireplaces, curtains and walls that indicate his financial position, class and profession. The individual will be at a piano, examining a sample of cotton in an office or waiting in the wings to go onstage.”22 Not surprisingly Duranty was thinking of Degas when he wrote The New Painting, and it is in the artist’s work that the idea of milieu plays out most powerfully. 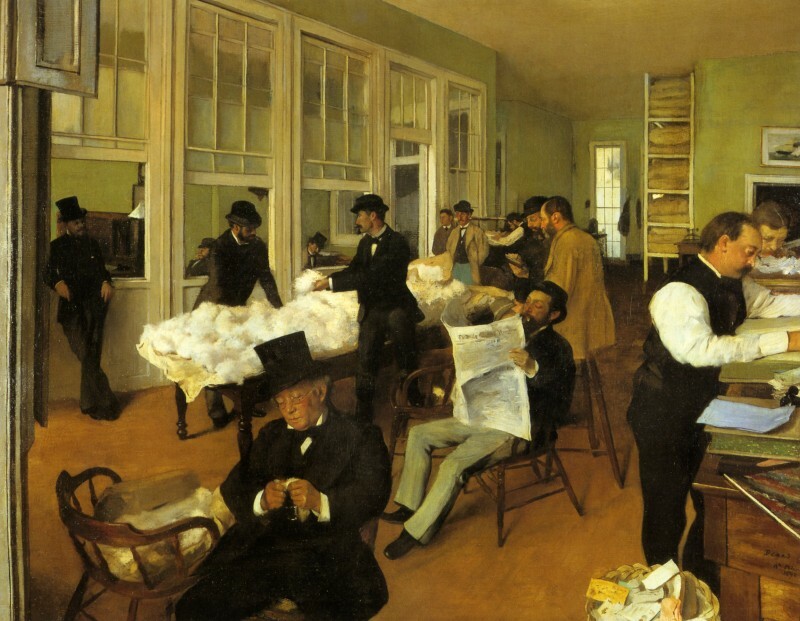 Portraits in an Office (New Orleans)—or A Cotton Office in New Orleans as it has come to be called—served as a key point of reference for Duranty, not least because it appeared at the second Impressionist exhibition in 1876 (fig. 7). It may also have served as model for Degas’s series of 1879 portraits as well—in the spring of 1878, just months before he began working on the picture of the stock exchange, the painting of the cotton office entered the collection of the Musée des Beaux-Arts in Pau, the first museum ever to acquire one of his works.23 A comparison of the two images of “business”—one clear and American, one murky and French—inevitably rests not only on their style, which has to do with an evaporating late Realism, but on an understanding of the milieu they describe, the non-neutral “background” against which the figures stand.24 Achille Degas, for example, slouching idly against an inside window of the cotton exchange at far left, is framed and portrayed by this setting in more or less the same way as Ernest May at the stock exchange. The difference is—thanks to the research of Marilyn Brown and others—that we know quite a lot about the milieu of New Orleans in 1872.25 And indeed, Degas seems to have wanted the Cotton Office to suggest a greater transparency to its setting. The crisp lighting, perspectival recession, and fine rendering of detail all serve this purpose. By contrast, it is very hard to understand where May is supposed to be standing. The painting’s darkness, flatness, and sketchiness only obscure the background and framing physical context. What, then, is the setting, the milieu, this picture of the stock exchange seeks to describe in 1879? The Paris Stock Exchange came to occupy its present location only in the early nineteenth century. 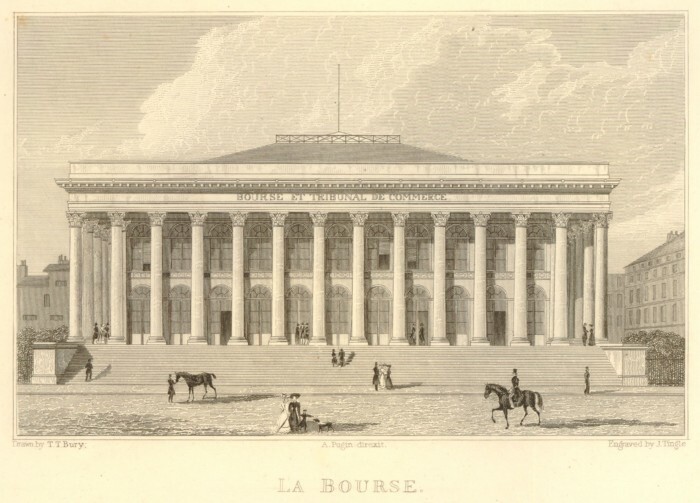 The cornerstone was laid by Napoleon himself in 1808, but La Bourse did not open for trading until November 1826. Soon enough, the building itself came to be called the Palais Brongniart after the principal architect, Alexandre-Théodore Brongniart. His instantly old-fashioned neo-classical design enclosed a vaulted and arcaded interior hall within a continuous exterior portico of large Corinthian columns (fig. 8). It is precisely these columns that give the first clue to the setting of Portraits at the Stock Exchange. Whatever architectural structure frames the figures of May and Bolâtre it is certainly not a Corinthian column; Degas’s painting simply does not show the “portico of the stock exchange.” It must, therefore, represent the interior of the building. The differences between the inside and outside of the Bourse would not have been obscure to a nineteenth-century viewer. The Paris stock exchange was for many years a tourist destination listed in any good handbook to the city, and a basic understanding of the layout of the interior and the activities on the floor of the exchange can be gleaned from such period literature. Here is Karl Baedeker in 1878: “The parquet, at the end of the hall, is a railed off space which the sworn brokers, or agents de change, alone are privileged to enter. In the center of this part of the hall is the corbeille, a circular, railed off space, round which they congregate, making their offers in loud tones. Various groups in different parts of the hall, but especially near the parquet, are occupied in taking notes, or concluding sales or purchases, the prices being regulated by the transactions going on in the parquet, while other persons are seen handing instructions to the brokers within the parquet.”26 Matching such verbal descriptions, an extensive iconography of the interior of the bourse existed in the nineteenth century. In Edmond Texier’s Tableau de Paris, the illustrator provides a view looking down from the visitor’s gallery of the second floor of the surrounding arcade—the parquet and the corbeille are just visible below (fig. 9). 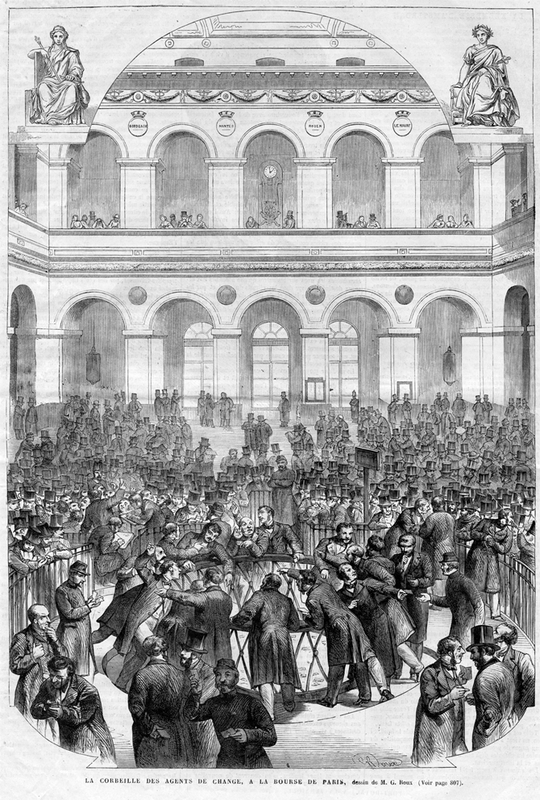 A few year’s later, a picture in Le Monde illustré takes us onto the floor, where the frenzied transactions of the agents de change inside the corbeille take on a more dramatic tone (fig. 10). These so-called agents de change were strictly regulated under French law, appointed directly by the Minister of Finance, and limited in number to 60. They held a monopoly on the exchange of valeurs mobilières, that is securities, including government bonds and common stocks, and they received a set commission for these tfransactions. At the exchange, the agents de change served as intermediaries and played no direct role in financial speculation. Investors in the kind of joint-stock companies trading on the exchange were understood to receive profits primarily from corporate dividends paid out every few months. As with government securities and state “rents,” such regulated and regular profits were often grouped with pensions and property investments (valeurs immobilières) in personal financial portfolios. As Thomas Piketty has demonstrated, the rate of return on such capital investments in the eighteenth and nineteenth centuries was stable and widely understood to be so. In the novels of Jane Austen or Honoré de Balzac, for example, “the equivalence between capital and rent at a rate of 5 percent (or more rarely 4 percent) is taken for granted . . . every reader knew full well that it took a capital in the order of 1 million francs to produce an annual rent of 50,000 francs (or a capital of 40,000 pounds to produce an income of 2,000 pounds a year), no matter whether the investment was in government bonds or land or something else entirely.”27 In the 1870s, similar presumptions still applied to the understanding of certain key artists within the Impressionist group. 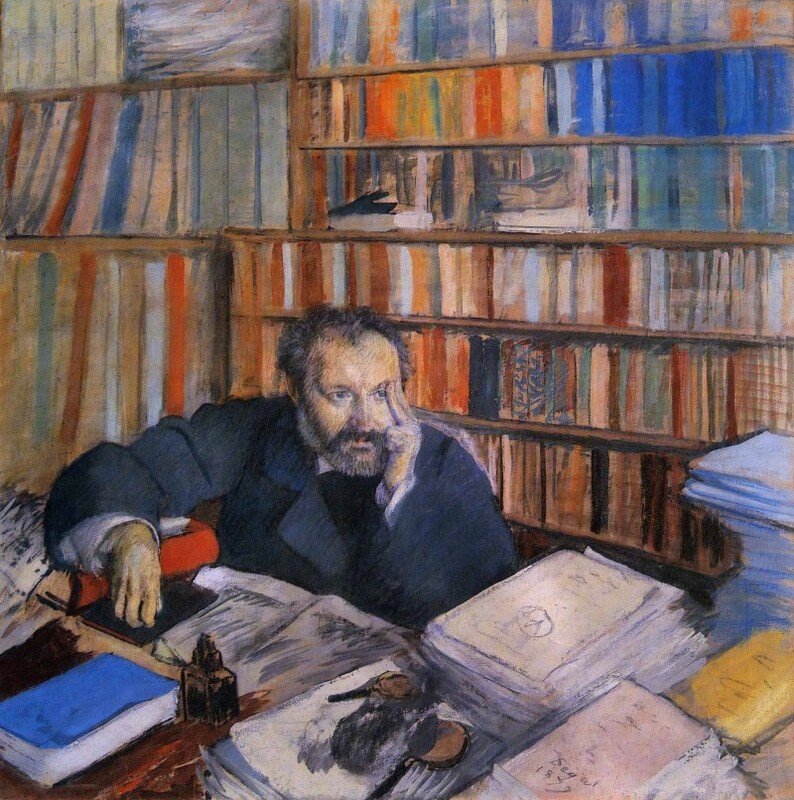 For example, in 1879 the critic Bertall claimed that Caillebotte collected rents of 100,000 francs, probably basing his estimate on knowledge that his father’s recently-settled estate exceeded two million.28 In fact, Caillebotte shared this estate with two brothers, and his wealth in 1879 probably totaled 700,000 francs at most—his annual income from property, stocks, and bonds came in around 30,000, just about the predictable 5 percent Piketty has shown was the norm in the century.29 In the short term, however, this norm was beginning to change. The temptation is obviously great to collapse the story of Achille Degas with the portrait of Ernest May. The architecture of the building confirms, however, that the setting of the painting simply cannot be the exterior portico or the steps of the Bourse. Was May then supposed to be trading inside at the corbeille? He was not a stockbroker, nor was he an agent de change. One key piece evidence in this regard is his hat. At least in the period imagery, the agents de change inside the corbeille never wear top hats. In fact, we know May was a high-level banker who would have stood well outside the enclosed parquet of the exchange. Where then, exactly, is he standing? 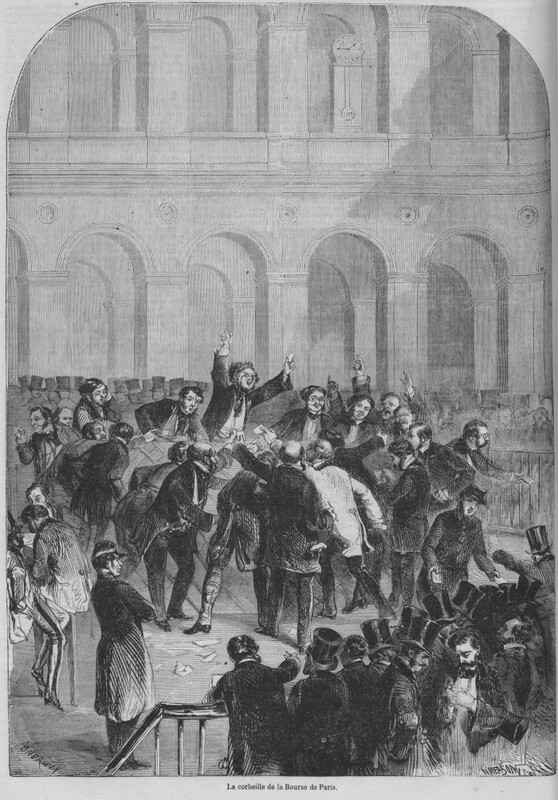 And with what significance for Degas’s (perhaps inevitably loaded) representation of financial dealing at the stock exchange in 1879? 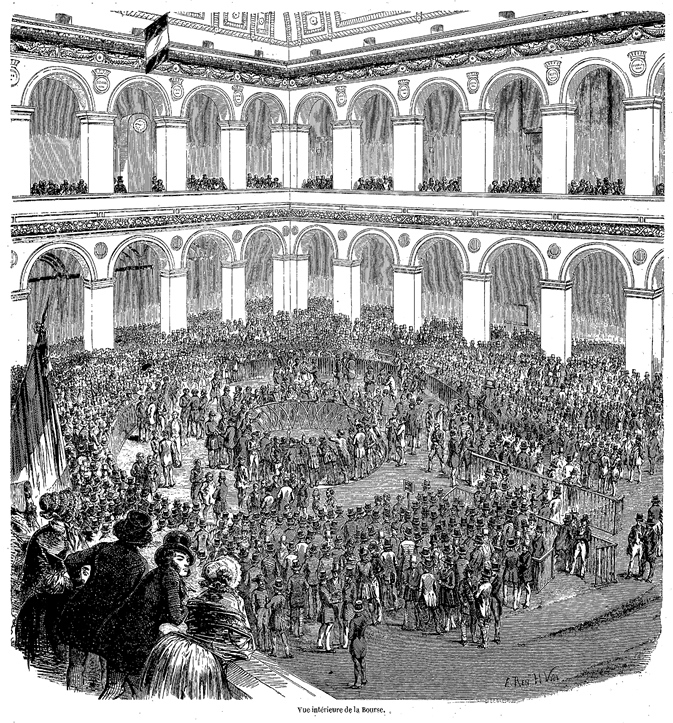 Of the extensive visual material depicting the interior of the Bourse, an engraving from L’Univers illustré of 1865 does the best job of situating May’s location (fig. 11). In the foreground of this print, waves of speculators crowd around the enclosed parquet giving orders to the agents inside, who in turn make their designated trades across the corbeille. In the middleground, all the way to the double-storied arcade at the edge of the building, crowds of bankers and financial agents attend the prices of trades and wait to jump in to the trading. In the back right corner of the hall, on two supporting piers near the corner of the arcade hangs some kind of framed document, in front of which smaller groups stand at a distance from the central action. The archive provides almost no evidence of the historical legibility of the painting’s now rather obvious setting. No one has ever noted it. If Leroy’s obscure remark offers anything to go on, however, its consistent misunderstanding since 1879 has everything to do with the deliberate lack of clarity in Degas’s ultimate rendering. Whatever the limits of iconographical analysis, Carol Armstrong does not get the tone of the painting wrong. The milieu represented in Portraits at the Stock Exchange may have been identifiable to its intended audience, but it surely would have struck a knowledgeable beholder as willfully selective and needlessly unclear. Why, the question might be asked, did Degas make it so easy to misread the setting as the exterior of the building? Why render legitimate stock trading so murkily? Of course, there are endless possible precedents for such a treatment. 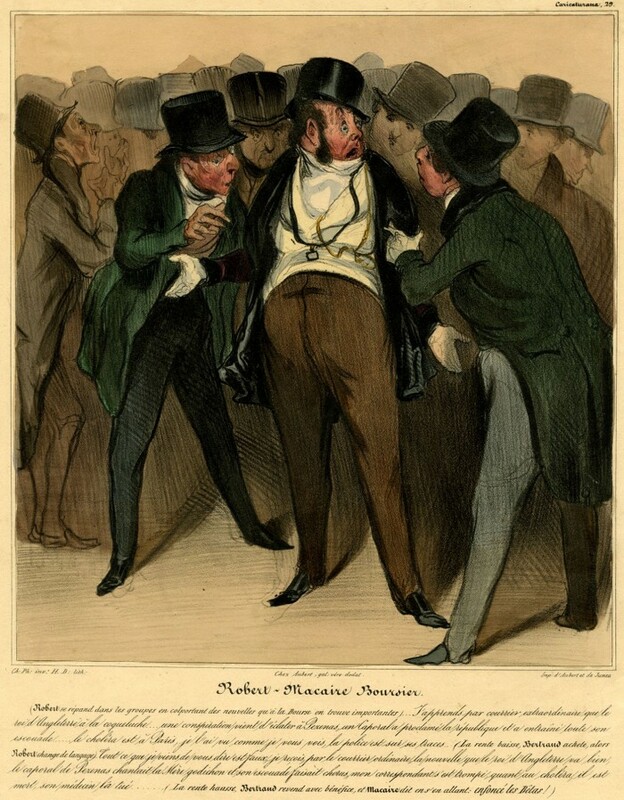 With a standard interpretation of the work no doubt in mind, some art historians have compared Portraits at the Stock Exchange to Daumier’s 1837 lithograph of the scoundrel Robert Macaire at the Bourse (fig. 13). The late-career exhibition of Daumier’s art was certainly on everyone’s mind in 1878, and Duranty’s review of the show in the Gazette des Beaux-Arts insisted, among other things, on the especially “mephistophelian” quality of the artist’s stock character: “Audacity, cunning, coarseness, malicious and insolent pleasure are written on this face. The tall cravat, covering the chin and sometimes the mouth itself, plays the role of a mask, and adds to the deceitful associations that attach to Robert Macaire.”34 Yet the visual resonance with the 1879 painting offers only a weak comparison, and surely even Degas would have hesitated to insinuate that May rhymed with Macaire. 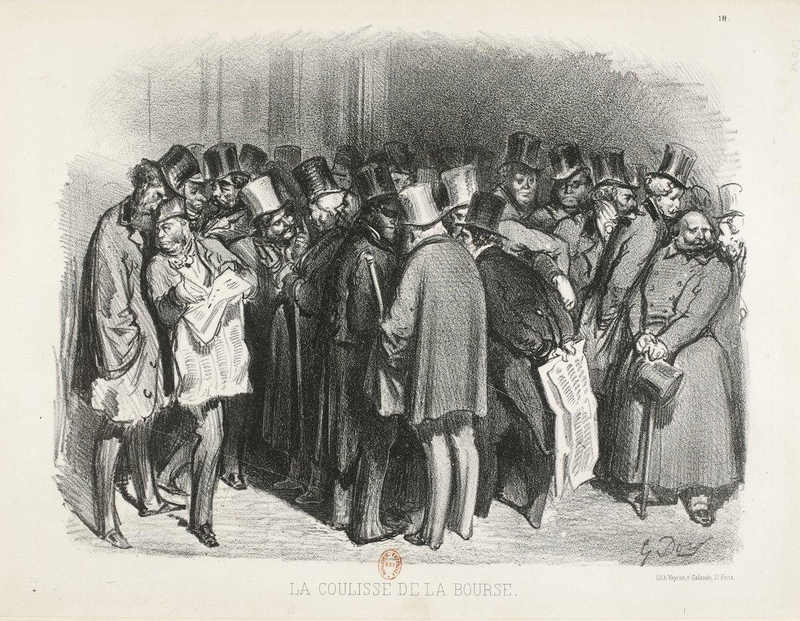 By contrast, Gustave Doré’s engraving of the “coulisse de la Bourse” offers a more obvious source for the painting (fig. 14). Located outside the Bourse, the coulisse constituted a famous and largely unregulated stock market operating in tandem with the official one inside the building. It took its name—roughly the “wings” of a stage—from a previous location near a store supplying Opera décor. Originally tolerated, the outside trading activity had been curtailed in 1857 and pushed into a black market that popped up all around the stock exchange, at Édouard Manet’s beloved café Tortoni, in the gallery of the Baromètre, in a casino on the rue de la Chausée d’Antin, and on the steps of the Bourse itself.35 Twenty years later, the “outside bankers,” or coulissiers, still made large sums from trades in derivatives, shorts, futures, and other similarly risky speculation on the actual stock prices set by the agents de change inside. One such coulissier working for the firm of André Bourdon earned the enormous salary of 30,000 francs in 1879. His name was Paul Gauguin. To give some sense of comparison, his earnings that year exactly match those of the rentier Caillebotte. Some years before, in the early 1870s, Gauguin had worked for Paul Bertin in the more menial position of liquidateur—a kind of money-collector and accountant—earning 200 francs a month, with an annual bonus of about 3,000.36 Even as he began to collect Impressionist painting, to study painting with Camille Pissarro, and to contribute a modest piece to the same 1879 exhibit, he continued to earn large sums at the coulisse from speculative trades, futures, and quick, profitable stock turnarounds. Of course, when the inevitable stock market crash came in 1882, he lost it all. At the time that Degas conceived and produced Portraits at the Stock Exchange, this murkier financial world was only beginning to seep onto the floor of the Bourse. Sales of shares in the Union générale bank and the brand new Panama Canal company, most famously, were just opening a decade of frenzied speculation followed by spectacular bankruptcies that came to emblematize the fin-de-siècle French economy. Ernest May was certainly at the forefront of the collapse of the two financial worlds, inside and outside the exchange. 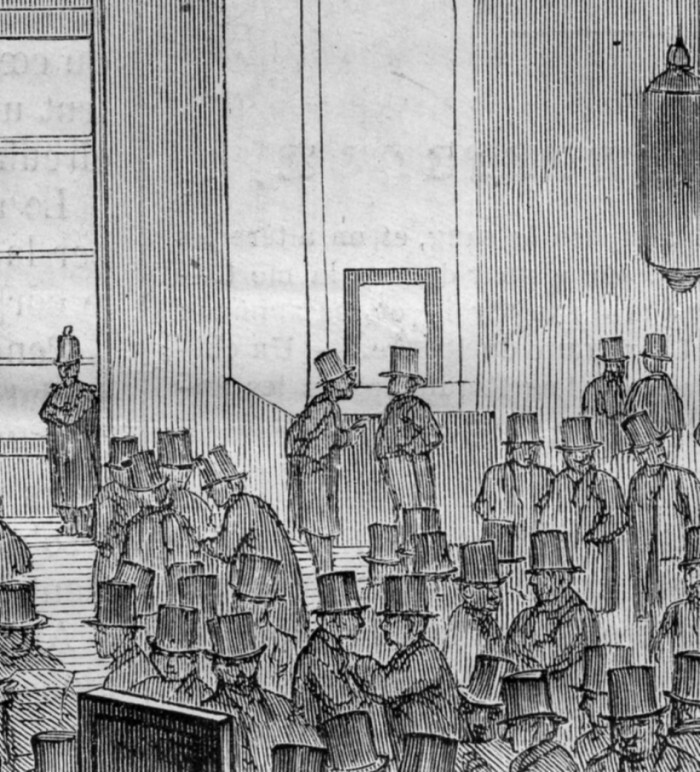 In 1879, however, the world of the coulisse and the new speculation-based economy still sat on the other side—or to put it literally: the outside—of the stock exchange. 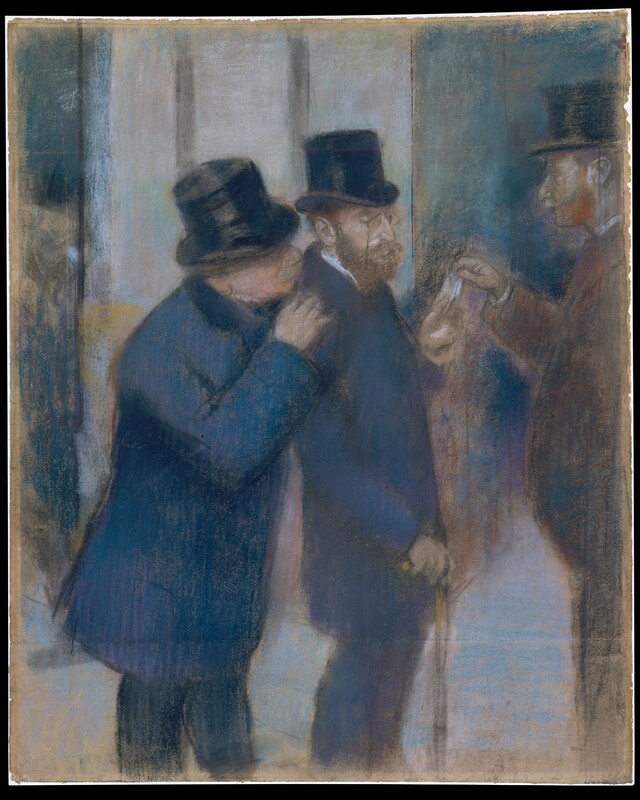 Degas’s painting thus offered a portrait of May and a picture of the milieu of the stock exchange, but it deliberately invoked the blurring of the interior space of the regulated agents de change and the murkier world of the coulissier outside. It gave a sense of how unknowable, secretive, and chaotic finance was coming to be seen. 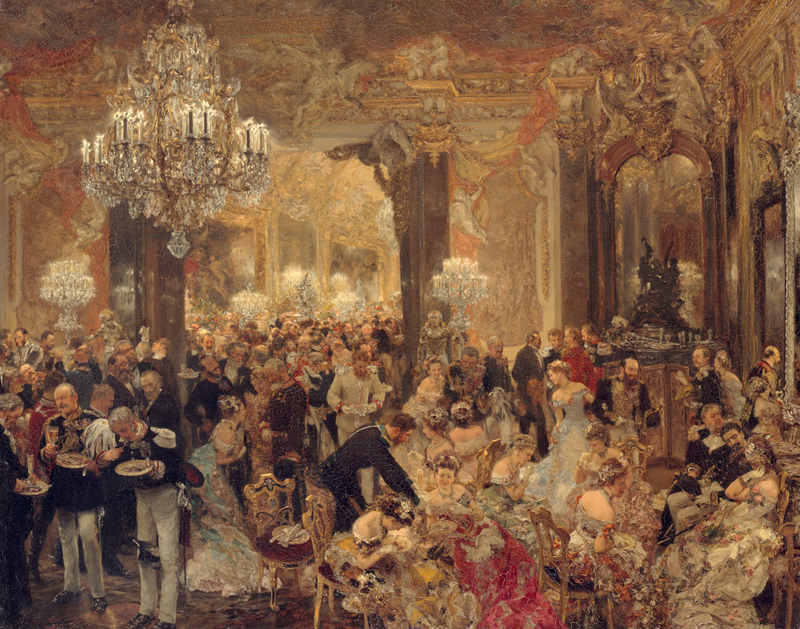 For the old-school bankers and for the rentiers, for Degas and Caillebotte, for May’s dinner companions in early 1879, this was a fundamentally different world of money, a world of new money. As Robert Herbert has noted, most of the key patrons of Impressionism “were not long-established members of high society, but wielders of new money: the financier Ernest May, the banker Albert Hecht, the retailer and speculator Ernest Hoschedé, the renowned baritone J. B. Faure.”37 Herbert evokes, without fully explaining, the relation between this new money and the new painting, but he suggests it may have something to do with the “caught moment” of Impressionism, or that is, the new pictorial temporality. In Degas’s case, the task of representing a new patron of the new painting involved blurring the distinction between the perceived stability of the older banking class from which he emerged and the evanescent world of finance capitalism with which Impressionism was increasingly associated. Degas’s picture seeks to synthesize these temporalities. Its setting indicates the slower temporality of the stable rentier economy that dominated the upper-echelons of wealth at the time and was consistent with the core function of the regulated market in the Bourse. It also shows the emerging, fleeting, fast, and future-oriented economy of the speculative market of the coulissier outside the Bourse. Or rather it depicts the former as the latter. Even in the move from pastel to finished painting, the increasingly sketchy and shady rendering accelerate the image into the sphere of the fast and unpredictable new economy. M. Bolâtre’s face sinks under the dark green shadow of his top hat; two crudely-rendered men flicker to life on the left of the arcade pier; and a blurred back jolts in front of May’s bordereau-wielding agent. Degas has rarely represented a set of hands so cursorily as those clutched behind this passing character. Or does the tangle of muddy pink brushstrokes imply May’s right hand still clutching his cane? The slight shift in the tone of the black paint suggests otherwise, and on its own the painting more evidently shows the banker holding the document with his right hand, allowing Bolâtre a clearer view over his shoulder. Degas’s quickly-dabbed brushmarks—sketchy, blurred, incomplete—create a frame for May, standing still and alone against the background pier, as the frenzied activity of the stock exchange whizzes around him. The descriptive function of this picture of the Paris Bourse thus seems to have been to collapse two previously distinct spatial configurations of economic activity, and in doing so to combine two kinds of pictorial temporality. The nearly photographic Realism of Portraits in an Office (New Orleans) has disintegrated, now in all its murky particularity, into the “fugitive” Impressionism of Portraits at the Stock Exchange.42 Neither one nor the other dominates—setting and sitter become one—but such is the peculiar nature of Degas’s art in 1879. Amid the broader argument in his much-discussed Capital in the Twenty-First Century, Piketty has recently pointed out that understandings—representations, we might say—of long-term economic trends are often obscured by shorter-term fluctuations. He calls this “the clash of temporalities.”43 One of the reasons, for example, that Austen and Balzac can serve to illustrate the consistent return on investment in the early nineteenth century is that intervening short-term economic fluctuations simply did not impact such returns at the time. Indeed, the longue durée history shows that the rentier system of wealth-consolidation persisted until World War I, and in a sense it has returned.44 But in periods of crisis or stagnation like the 1870s and 1880s, the appearance of frenzied speculation disrupting the stable banking of the past can be hard to dispel, and an understanding of its significance is not without its use. In any case, Degas was certainly in no position to ignore it. This essay incorporates material treated more fleetingly in my book, Realism in the Age of Impressionism: Painting and the Politics of Time (New Haven: Yale University Press, 2015). A shorter version of the current analysis was first presented publicly in Chicago at the meeting of the College Art Association in February 2014. My thanks to André Dombrowski for organizing the panel on “The Nineteenth-Century Image of Money.” Subsequently, Bridget Alsdorf, Sarah Betzer, Holly Clayson, Todd Cronan, and Seamus O’Malley have given constructive comments on the argument. As always, my wife, Gabrielle Larocque, offered immeasurable support all the way through. All translations are mine unless otherwise indicated. 40. Melot, “Camille Pissarro in 1880,” 32, reprinted in Lewis, Critical Readings, 209. Marnin Young is Associate Professor of Art History at Stern College for Women, Yeshiva University. He has published articles and reviews on nineteenth-century French art in The Art Bulletin, Art History, Critical Inquiry, Nineteenth-Century Art Worldwide, and the RIHA Journal. He is the author of Realism in the Age of Impressionism: Painting and the Politics of Time (Yale University Press, 2015). His current research focuses on space in and around Post-Impressionist painting.